Did you know that one of the biggest threats to rainforests worldwide is unsustainable agriculture practices? 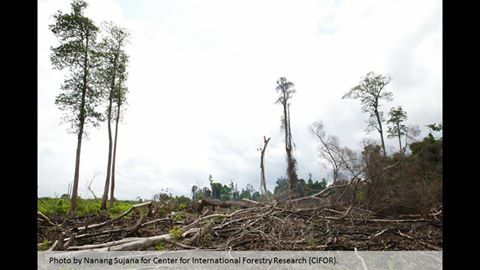 Rainforests are stripped bare to make way for crops. The irony is, although rainforests are home to over half of the world species and considered one of the most biodiverse ecosystems on the planet, they are notoriously poor for growing crops. Rainforest soils are some of the least fertile on the planet. The topsoil layer in rainforests (the organic layer material at the surface) is sustained because of biomass. Biomass is the total mass of organisms in an area. Biomass is very high in rainforests and is the only reasons rainforests even have a topsoil layer. In rainforests, death sustains life. When an organism dies it decomposes very quickly in the humid tropics and allows for other organisms to thrive with a release of minerals and nutrients. The type of soil in rainforests is referred to as oxisols. Oxisols have a thin organic matter layer (in rainforests this is because the organism are decomposed so quickly and immediately recycled back into the system). Oxisols are depleted in minerals, partly because of the decomposition rate of organic material and also because of the amount of rainfall that leaches most minerals out of the system. These soils are a shade of red, due to the high levels of iron. When biomass is removed from an oxisol and new crops are planted, there is nothing left to form the topsoil layer (built from decaying organic material). This makes growth difficult for the new plants that usually survive only for a few years. These highly diverse and flourishing ecosystems are balanced precariously, depending on an intact and healthy system to continue to survive. ¿Sabías que una de las amenazas más grandes para las selvas tropicales es la agricultura? Áreas de selva son destruidas para poner en su lugar cultivos. La ironía de esto es que aunque la selva tropical es el hogar de la mitad de las especies mundiales y es considerado uno de los ecosistemas más diversos en el planeta no puede sostener cultivos por mucho tiempo. Esto es por el tipo de suelo que hay en las selvas tropicales. Este tipo de suelo (tierra) se le refiere como un oxisol, rico en hierro y bajo en minerales. La capa superficial del suelo se regenera con organismos en descomposición como platas y animales. Cuando la tierra es despojada no existe regeneración de esta capa superficial, lo cual hace que los cultivos plantados no duren por más de unos años.